As an artist, having a high-quality digital portfolio is one of the most important things you can do for your career. I work with artists every day, some who already have a rocking digital portfolio and others who don’t, but it’s generally understood by all that it’s a necessity. There are ever-increasing opportunities to get your artwork out there and connect authentically with people who might be interested in buying your art. Online art purchases are steadily on the rise, and if you’ve been watching the trends in every other area of our world, you know the shift to digital is only going to continue. Despite your opinion on the desirability of this shift, it does give us more points of connection than ever with people all over the world, which means more chances for someone to engage with your artwork. If you don’t have high quality images of your work, you miss out on all these opportunities! The ability to make and sell prints. If you have high-resolution images of your work, you can start getting more out of each artwork than just the sale of an original. Prints are also a great way to get fans purchasing your work even before they can afford an original. With the rise of Print-On-Demand sites, there are a number of places you can sell your work as wall prints or on products. The ability to submit to galleries. Galleries are increasingly requesting submissions in a digital format. Clear, high quality images of you work communicate that you take what you’re doing seriously and you’re someone they can trust with a show at their gallery. Galleries, as you know, have the potential to be a great point of in-person connection with collectors, curators, etc. The ability to promote and sell online. Online sales have risen to over $3 billion, and as I’ve said, current trends suggest the move to online will not slow down. Now is the time to be learning how and where to sell online. Regardless of where, you’ll need images that represent the true quality and appearance of your artwork; it’s a prerequisite to successfully selling art online. 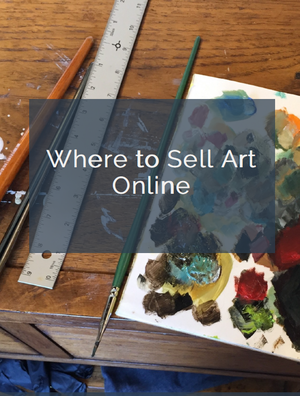 Beyond direct selling online, the chances to connect buyers to your artwork online is mind-blowing. Between different social media sites, online communities, personal websites, blogs, email and more, you can have hundreds of thousands of people from around the world viewing your work. Make sure your images are worth viewing! Building your high quality portfolio – sourcing professionally photographed images and storing those images – is an investment. I’ve found artists tend to struggle with thinking of themselves as entrepreneurs, but that is what you are. And as an artist entrepreneur, there are very few investments more beneficial to your art business than a high quality digital portfolio. If you have a well-thought out promotion and sales strategy, the opportunities opened up by a digital portfolio can grow your sales by 10x, 50x, 100x (and knowing the power of the internet, those numbers are conservative). Art is a visual medium. People connect with art that appeals to their visual senses. In the physical world (in galleries, at festivals, in your studio, etc. ), people have the opportunity to see your real work, up-close and personal. They know what they’re getting. I see far too many artists posting shoddy images of their artwork online and wondering why their work doesn’t sell. The lighting is inconsistent, the color is off, and the crop and alignment are skewed. Again, people buy art they connect with on a visual level. They will not buy art online based on a poor quality image they don’t trust. Get professional quality images of your artwork. Whether you learn to capture great images yourself or pay a professional, this is step #1 and none of the rest matter until this is done. Get a system for storing and managing your images. These digital images are “assets” to your business. Find a service or system for securely storing and organizing them. Additionally, learn how to manage and resize your images so you’re ready to take advantage of all the opportunities out there. Find an artist mentor who is doing all these things. The best way to stay stuck is not to ask for help. There are artists who are making constant connections online and offline through use of their digital portfolio and effective marketing strategies, and they’re selling their art! Make time to meet with these people, pick their brains, and find out how the principles they’re using fit into your art business. I hope this article helps you either get started and push forward building and promoting your digital portfolio. In the comments section below, I’d love to hear what challenges you face in this area, where you’ve seen success promoting your work online, and any questions you have about moving forward! Thank you for this kind opportunity to help artists show their crafts with the whole out there. Artists tend to be reclusive either by nature or they just don’t know how to reach out to a larger audience for their works,which is a pity. Now we have the tools to be known outside of our comfort zones. Thank you sir. You’re welcome, Alsier. I absolutely agree. I know for many artists it can seem like a scary and daunting task to get started, but if you take it step-by-step it opens up a huge amount of opportunities to share your art with the world. Pretty neat. You’re welcome, Shan. Thanks for the feedback! I have a very basic question, which arises because I have been away from graphics and computing for about six years… a lot has happened in the digital world since then. I used to use Photoshop and a point and shoot digital camera. I would upload my images from the camera to my computer (by a wire), then I would gradually resize my pictures until they were down to 72ppi for the Internet. I used to upload them in batches to my website, or to websites that I had developed for others. The uploading was done through our MODEM, with special fast file transfer software. My question now is this: Does one still have to resize photos in Photoshop, and then upload by wireless MODEM, or does the photo gallery software, which accepts the photos from you camera, do that for you? Can SLR digital cameras do that (resize) also? Is that what “Sharing” is all about? Perhaps you can guess… I don’t at this point have a smart phone, but can they also upload to a blog or website? When I ask people these questions… they just say to press this button, then that button… so I am none the wiser!